Of your charity, pray for the repose of the soul of Abbot Christian Feurstein, O.Cist., former Abbot of Stift Rein in Styria, who died last night after a long struggle with heart disease. Abbot Christian was a monk of Stift Heiligenkreuz before being postulated as abbot by the monks of Stift Rein. For many years he was prior and novice master in Heiligenkreuz. He was my novice master, and I will be eternally grateful for kindness and patience in leading me into the monastic life. Every day for a year the other novices and I had lessons on the Rule of St. Benedict and Psalms from him. I’m afraid that I may have been a somewhat trying disciple. “It befitteth a master to speak and teach,” St. Benedict teaches in the Holy Rule, “and it beseemeth a disciple to hold his peace and listen.” But I had come fresh from the disputatious atmosphere of the great books seminars of my college, and was accustomed to speak and argue, while a tutor held his peace and listened. But if Pater Christian found me trying, I never knew it; his patience with me was boundless. The novices of ’06-’07 and ’07-’08 with Novice Master Pater Christian, Abbot Gregor, and the Subprior of Stiepel, P. Jakobus. The author of this blog is in the back row on the far left. He was not a man of great speculative brilliance, but he had a deep experiential wisdom from a life of fidelity to Christ. He was great example of true monastic humility. I do not think that I have ever met a more humble man. “The seventh degree of humility,” St. Benedict teaches, “is not only to pronounce with his tongue, but also in his very heart to believe himself to be the most abject, and inferior to all.” I remember Pater Christian telling us about some renowned intellectual giving a talk at Heiligenkreuz’s priory in Stiepel, in the Ruhr Valley (P. Christian was one of the founding monks of that priory). The intellectual was talking about how the seventh degree of humility is terribly bad, and that a healthy person has to have self-esteem etc. P. Christian tried to defend St. Benedict, but was unable to convince the intellectual. He couldn’t explain it, but he knew that the seventh degree of humility was good. I think that he knew it con-naturally, because he had attained it in his own life. In recounting this story, P. Christian laughed. He had not, you see, attained the tenth degree of humility, for he was very prompt to laugh. He was postulated as Abbot of Stift Rein in Styria in 2010, the year that I took solemn vows in Heiligenkreuz. Once when I visited him there he was preparing to go officiate at a funeral in a nearby parish. Someone else told me that the abbot was constantly doing funerals in that parish, since the parish priest there, a monk of Stift Rein, was “too busy.” It was typical of Abbot Christian that despite the many burdens of his abbatial office he did not think himself too busy to help out in parishes. In 2015 he resigned as Abbot of Rein on account of his heart condition, and returned to Heiligenkreuz. He suffered much through his long sickness. After a stroke that followed one operation he was unable to speak. But he could still smile. He died last night in the hospital with a number of the confrères praying the commendatio animae at his bedside. His body will first be taken to Stift Rein, where the Bishop of Graz-Sekau will sing a requiem for him on March 21st, and then his body will be taken to Stift Heiligenkreuz where the Requiem and burial will be on March 24th. A few weeks ago a friend of mine sent me a book by an anonymous Benedictine monk which had just been published: In Sinu Jesu. I have been reading it slowly in the adoration chapel of the seminary here in Heiligenkreuz, and although I haven’t finished yet, it has already made a deep impression on me. It is the sort of book that one wants to read in chapel; and this makes it difficult to write about. It a book about the intimacies of prayer, and therefore not one that lends itself to “blogesterial” discussion. It is a book that should be read in silence. It is a journal that the author kept at adoration, and consists largely of words “given” to Him by our Lord and our Lady. These words are mostly about prayer, and adoration, and sacrifice, about friendship with Jesus, and about the renewal of the priesthood. Readers who want to get a flavor of it can consult Peter Kwasniewski’s posts at Rorate Caeli and The New Liturgical Movement, as well as the excerpts that Dom Mark Kirby has posted at Vultus Christi. The theme is of course a traditional one, because it has to do with the condition of fallen man as such. Exiled from friendship with God through original sin, mankind wanders through the regio dissimilitudinis, and tries to numb the pain through importunitas mentis, inquietudo corporis, instabilitas (vel loci vel propositi), verbositas, and curiositas. In Sinu Jesu treats the problem particularly as it presents itself in the priestly life. The author is both a monk and a priest, and he shows how fitting it is for all priests to live at least some elements of monastic life. These elements are aimed at leading the soul into the “desert,” as it were, where it is free of diversions and distractions, and becomes able to feel the pain of the loneliness of sin, in order then to receive the healing consolation of Christ. In the Western Rite, all priests are at least required to live a celibate life, and In Sinu Jesu is in part a wonderful reflection on the beautiful and prophetic witness of celibacy. And yet priests engaged in the cura animarum, especially in a modern world that is so intent on diversion (and so skilled in producing it) can so easily fall into diversion’s trap and in “seek in other places” the consolation that can only really be found in Christ. In a way, In Sinu Jesu reads like a commentary on Pope Benedict XVI’s sermon at the closing Mass of World Youth Day 2005. Not a speculative commentary, but an experiential illustration. I’m convinced that any reader who is willing to enter into the spirit of this book will be inspired with a new desire for union with God in prayer. I cannot recommend it too highly. Congratulations to our master of ceremonies in Heiligenkreuz, Pater Cœlestin, who has been appointed secretary of the Liturgical Secretariat of the Cistercian Order. An excellent choice; Pater Cœlestin is a tremendously efficient, hard working, good humored fellow; a great lover of the beauty of the liturgy, but one with the practical skills to get things done. (How time flies! I remember when P. Cœlestin first came to the monastery as a guest, and asked me what Tu autem Domine means). Pater Cœlestin’s first letter to the order as secretary has just been published in various languages, including English, and the original German. The English translation, by Fr. John of Dallas, is quite good, but it omits the most characteristic sentence of the whole text. In bewailing the fact that the Trappists of Westmalle no-longer print the beautiful books of Cistercian chant for which they were once famous, Pater Cœlestin writes, “Heute machen sie nur noch Bier” (today they only produce beer). The sentence is simply omitted in the translation. And because we receive all monks coming from other monasteries into ours, and they in like manner receive ours; it seems proper to us, that all our monasteries should have the same usage in chanting, and the same books for divine office day and night and the celebration of the holy sacrifice of the Mass, as we have in the New Monastery [Cîteaux]; that there may be no discord in our daily actions, but that we may all live together in the bond of charity under one rule, and in the practice of the same observances. The vicissitudes of history, however, and especially ill-conceived attempts at aggiornamento following the last ecumenical council, have introduced a bewildering diversity into liturgical practice of the order. Thus, for example, Pater Cœlestin notes that 75% of Cistercian monasteries now celebrate the Divine Office in the vernacular (in direct opposition to Bl. Paul VI’s Sacrificium laudis). That makes the task of the Liturgical Secretariat difficult. It is to be hoped, however, that Pater Cœlestin will be able to realize some long contemplated projects: such as a new edition of the Cistercian Gradual. Although the life of a monk ought at all times have the aspect of Lenten observance, yet, since few have strength enough for this, we exhort all during these days of Lent to lead lives of the greatest purity, and to atone during this holy season for all the negligences of other times. This we shall do in a worthy manner if we refrain ourselves from all sin and give ourselves to prayer with tears, to reading, to compunction of heart, and to abstinence. Therefore during these days let us add something to our ordinary burden of service, such as private prayers or abstinence from food and drink, so that each one may offer up to God in the joy of the Holy Ghost something over and above the measure appointed to him: that is, let him deny his body in food, in drink, in sleep, in superfluous talking, in mirth, and withal long for the holy feast of Easter with the joy of spiritual desire. In the Cistercian and Benedictine orders November 14th is the Commemoration of all the departed souls of the monks and nuns who lived (or “fought” [militaverunt] as the breviary puts it) under the Rule of Our Holy Father St Benedict. I celebrated a Requiem Mass (OF) on the high altar of the parish Church in Trumau. During Mass I thought of all my departed confréres whom I knew: admodum rev. PP. Alban (who died before I entered the monastery, but whom I met when I was a guest), Adolf, Cornelius, Sighard, Ansgar, Franz, Alberich, Raynald, and Gottfried. I also thought of the persons killed in Paris yesterday (though as far as I know none of them lived according to the Holy Rule). The collect for the Mass addresses us to the the divine mercy, which we never invoke without hope: “Deus, cui numquam sine spe misericodiae supplicatur.” Coincidentally, the Islamic State’s statement on the Paris attacks also begins with a reference to the mercy of God: “Au nom d’Allah le Tout Miséricordieux, le Très Miséricordieux.” I’m afraid that reminds me of Hilaire Belloc’s book, The Mercy of Allah. 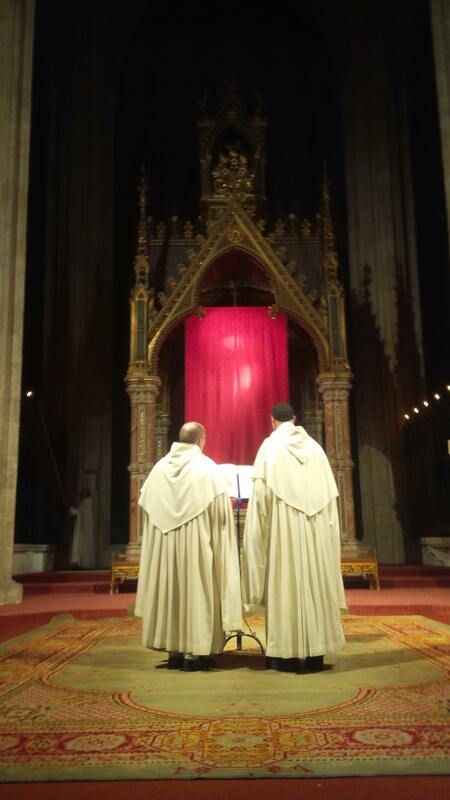 Two brothers sing Psalm 21 (22) during the stripping of the the altars today, Maundy Thursday. Photos of the mandatum this morning. For more on the mandatum in Heiligenkreuz see my 2013 post on the subject. For more on the meaning and history of the mandatum see Peter Kwasniewski’s post at The New Liturgical Movement, and Jeremy Holmes’s at New Song. Of your charity, say a prayer for the repose of the soul of my confrère P. Gottfried Eder, O.Cist. died on the Fourth Sunday of Advent, and whom we buried today. He had been a parish priest in one of our parishes for many years, and only returned to the monastery six years ago when his long final illness had already begun. The adjustment was not entirely easy for him, although he had a very gentle and mild temperament. Commendámus tibi, Dómine, ánimam servi tui N. * precamúrque, ut, propter quem ad terras tua pietáte descénderas, † patriarchárum tuórum sínibus insinuári non rénuas, * qui vivis et regnas in sǽcula sæculórum.